The next day, my parents checked out of their cabin in Colter Bay and moved up to one adjacent to Old Faithful in Yellowstone. 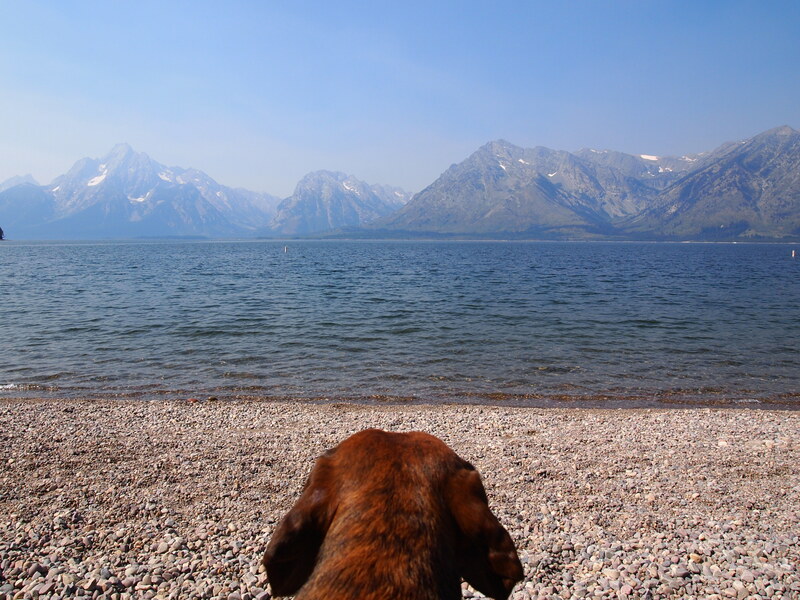 They couldn’t check in until the afternoon, so Zach and I lounged around in the morning, getting coffee at the Colter Bay General Store, taking Truman to check out the Tetons, going down to the beach at Jackson Lake (where dogs ARE allowed), and eventually relaxing at our campsite. We drove up to Yellowstone in the afternoon to meet up with my parents and go for a hike. 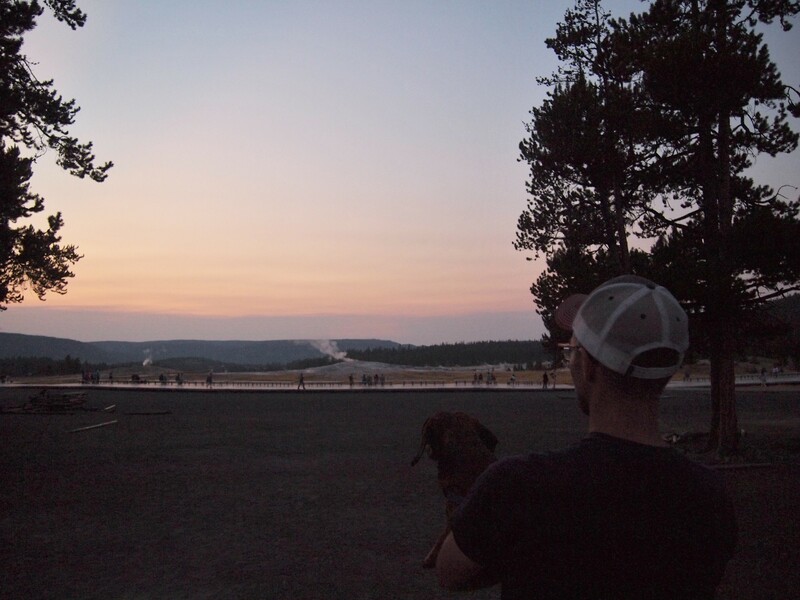 Though we visited Yellowstone back in 2014, it was purely an introduction to the park. We’ve wanted to go back and hike for a while. We left Truman at their cabin and took off for a late afternoon hike. Since my parents were staying by Old Faithful, I picked a hike near the Midway Geyser Basin. The beginning of the trail is incredibly popular because it leads to an overlook of Grand Prismatic Spring (something I wanted to do as well), but this also meant that parking was crowded. 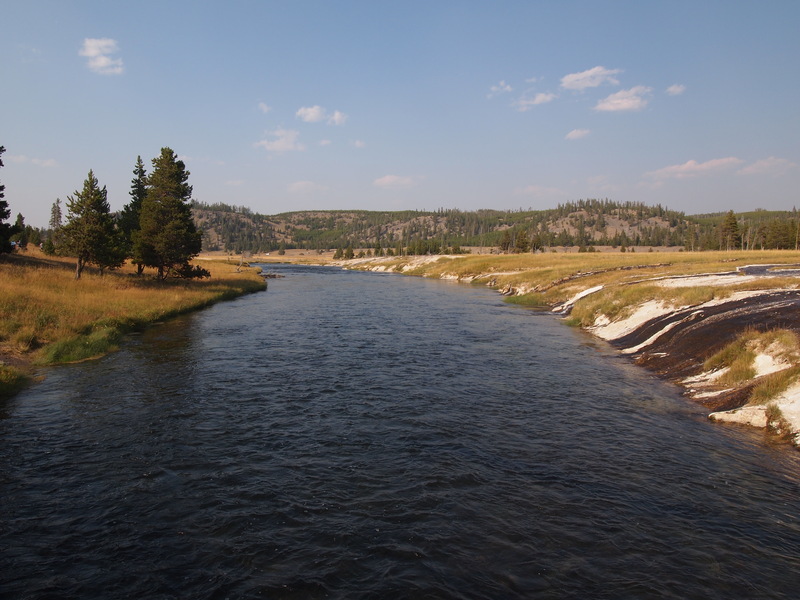 We parked south of the Midway Geyser Basin parking area in a gravel lot and walked to a steel bridge spanning the Firehole River to begin the hike. 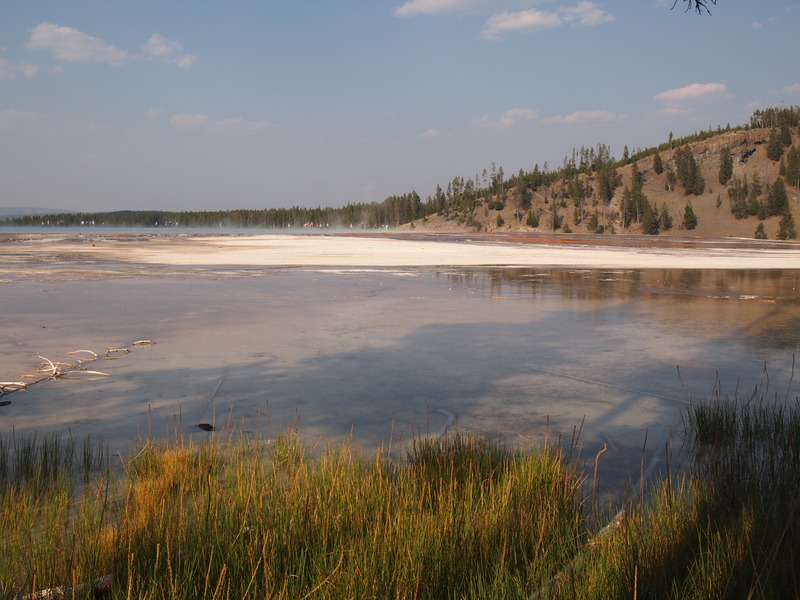 The first mile of the hike is a wide dirt path that follows the edge of the Midway Geyser Basin. 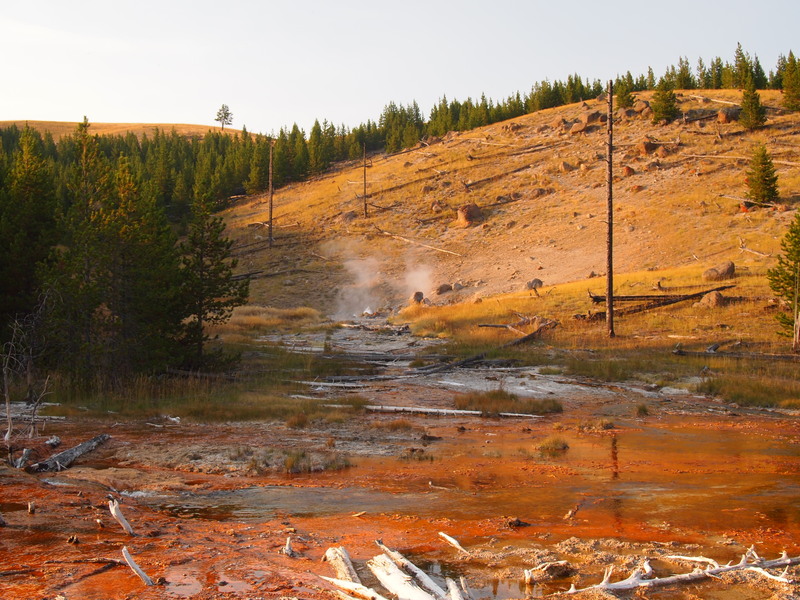 Most people on this portion of the trail are going to and from the Grand Prismatic overlook. Through the thin crowd of trees we had a decent view of the tourists walking the boardwalks of the Basin. 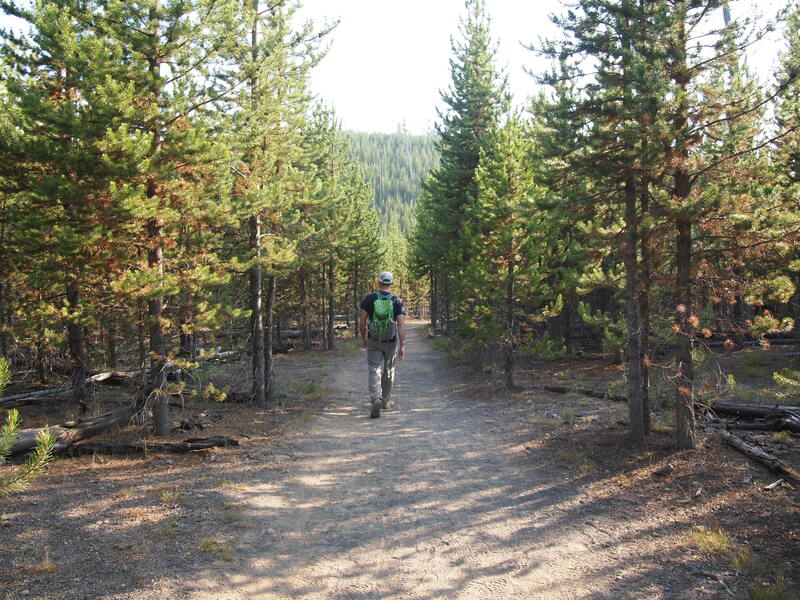 Once we reached the true trailhead for Fairy Falls, we turned off the road-like path and began a nice 1.6 mile walk through a young forest of lodgepole pines. The hike was very easy but quite pleasant. 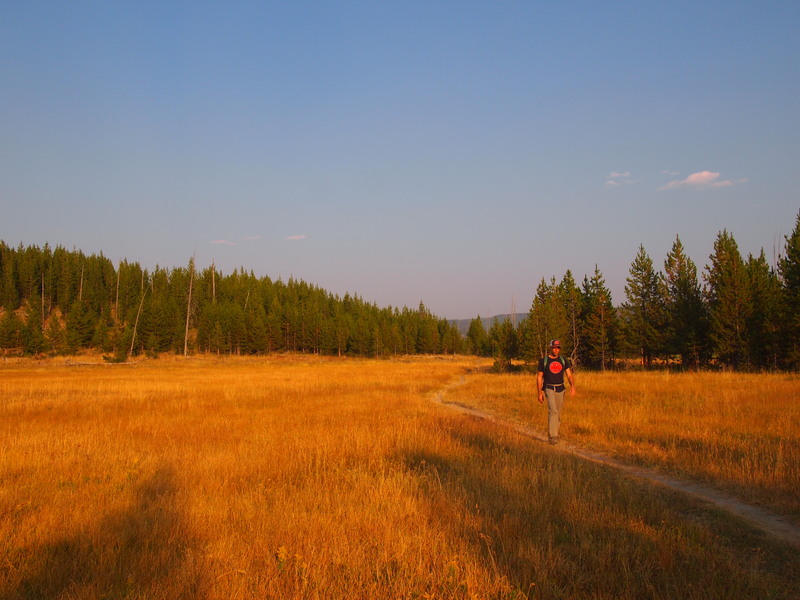 Since we were starting later than most people, we often had the trail to ourselves. Soon we came out of the pines and realized the waterfall was just ahead. 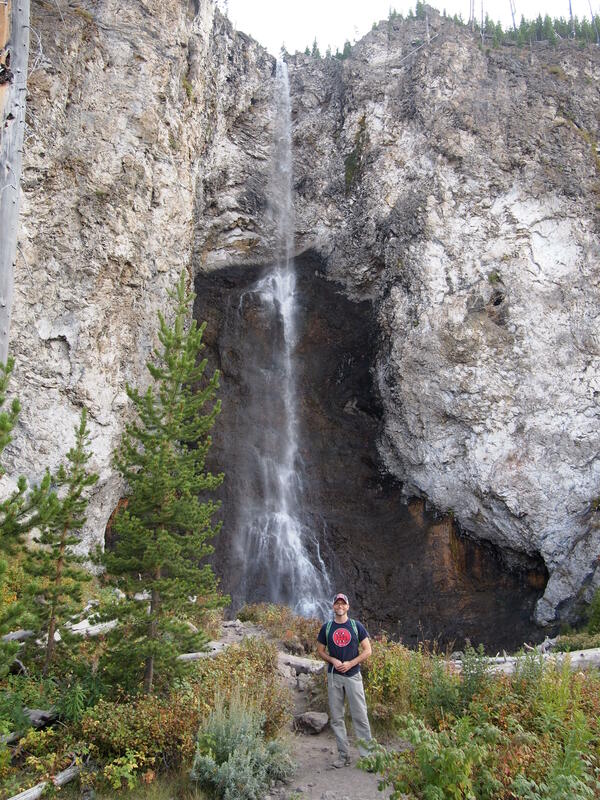 It was a gorgeous waterfall, and I – skeptical of all waterfall hikes – was impressed. We had the fall to ourselves and spent some time admiring it before we decided to continue down the trail. Past the waterfall, the trail leads to two active geysers, Spray and Imperial. I was hopeful that we could make it to both, but in the end we only went as far as Spray Geyser. I wanted to be able to make it back to the Grand Prismatic overlook before the sun was too low and we just couldn’t do both. I wish we’d had just a little more time before sunset. However, it was worth going as far as we did. 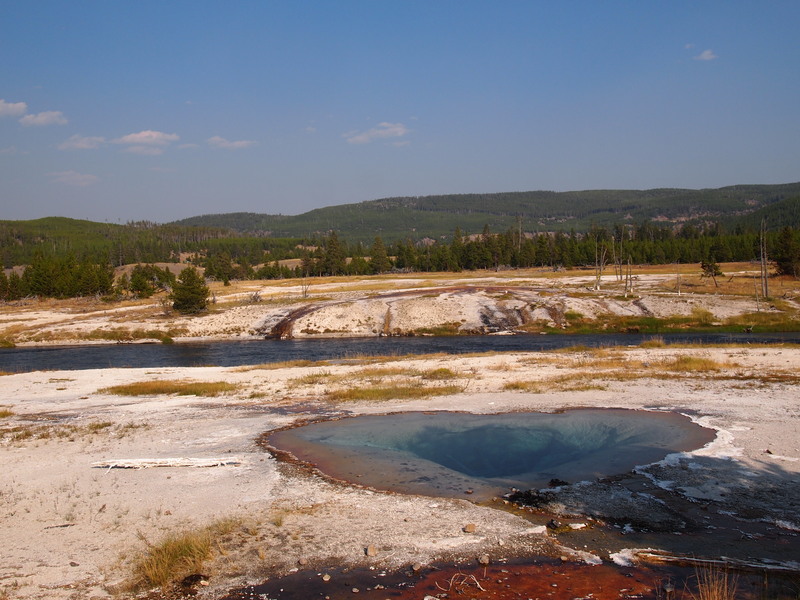 We had only seen geysers from boardwalks and this gave us the chance to see one in a more natural state. It was pretty cool! 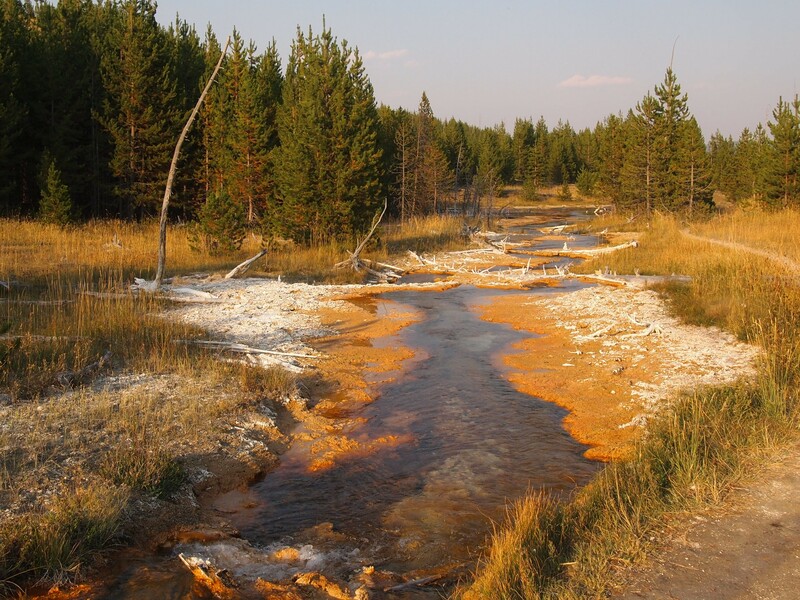 Plus, the side trail we took to what we think was Spray Geyser lead us along a creek that had cool thermal features too. Thankfully we did get to the overlook before it was too dark, and it was spectacular! 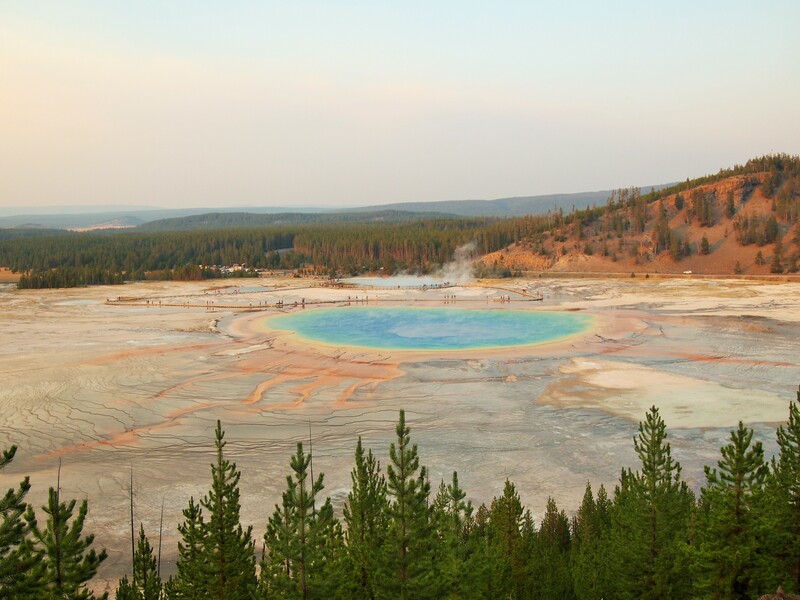 As neat as Grand Prismatic is from the boardwalk, getting a bird’s eye view from the overlook is even better. I’ve wanted to go to the overlook for the last 3 years, and we finally did! We had one last order of business after we picked up Truman: a picture with Old Faithful! It’s a little dark, but you get it. 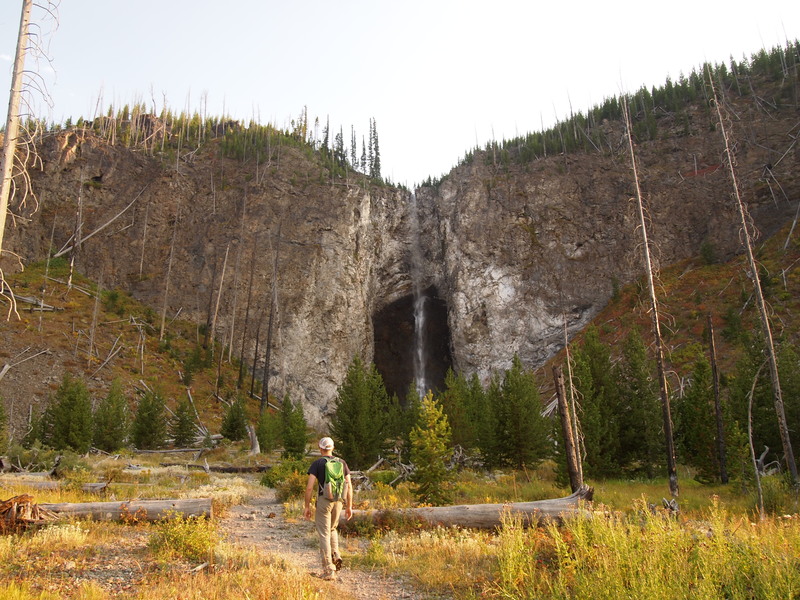 We definitely hope to get back to Yellowstone next year for more hiking.